Chef Brian's books, co-authored by renowned food writer Michael Rulhman, have been seen as helping bring about the revitalization of Charcuterie, and it's many forms, in the United States over the past decade. Both books are beautifully written and the recipes work, what more could you ask for from a cook book? Find out for yourself why so many cooks have this book in their kitchen." Charcuterie: The Craft of Salting, Smoking, and Curing encompasses a broad array of meticuously tested dishes. Whether you are a beginner or seasoned professional, this beautifully written book will challenge and inspire you. Coppa, prosicutto, lardo, spalla; this is Salumi. 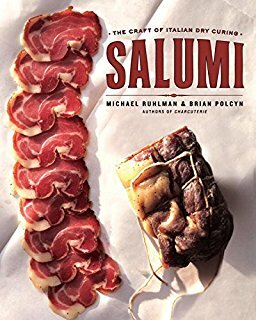 An ancient craft, this book takes these time honored dry-cured meats and adapts them for the modern American kitchen. Complete with photos on performing European seam and USDA butchery, this book is thorough. This book will showcase a facet of Charcuterie that is rapidly growing in popularity around the country. The Pâté and Terrine revolution is upon us, and it begins with the release of this book in Spring of 2019.